Kuala Lumpur, Malaysia/Chennai, India – January 6, 2017 – Panasonic Group of companies in Malaysia has signed a multi-million-dollar strategic deal with Ramco Systems Sdn. Bhd. Malaysia part of India-headquartered HR software major Ramco Systems to digitize and transform HR and Payroll operations for nearly 20,000 employees nationwide on a unified platform. Panasonic Group of companies in Malaysia, part of the leading Japanese electronics manufacturer, said employees in 21 entities using multiple systems currently will now be powered by integrated Ramco HR software giving a seamless HR experience, group-wide. Ramco System’s award-winning Human Capital Management (HCM) solution will integrate with multiple Enterprise Applications and Finance systems in individual companies for statutory and payroll requirements. 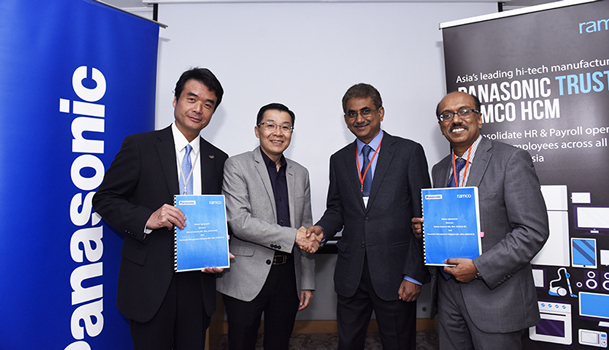 Panasonic Group of companies in Malaysia will lead the Digital HR transformation initiative with a cloud-hosted Ramco HCM suite covering Core HR, Time & Attendance, Talent Management, Recruitment, Planning & Analytics in addition to Payroll. With this initiative, the role of HR Management in Panasonic Group will evolve from administrative roles to more strategic and business transformation roles by leveraging the Reporting and Analytical capabilities of this new system. On the part of Employees by using this new integrated system, all the tedious and time consuming HR processes will be simplified and fully automated. Employees can now be able to apply leave, manage claims, and pull pay slips using self-service features across various platforms including smart phones, tablets and desktops. Ramco Systems has seen significant growth in APAC, winning the trust of leading multinationals and Fortune 500 companies. As one of the fastest-growing markets for Ramco, APAC holds immense promise and potential. Ramco HCM with its Global Payroll coverage recently won an order from European Logistics major for consolidating its HR operations across 13 countries. Trusted by 400+ global customers, Ramco HCM & Global Payroll with Time & Attendance is compliant with statutory and taxes across 40+ countries and has partnerships to cover Payroll for 108 countries, globally. Recognized as an Achiever in Everest Group’s Multi-Country Payroll Assessment, Ramco HCM with built-in Mobility and Intuitive user experience continues to add on an average two new customers a week in 2016. With a comprehensive coverage of APAC, Middle East and Australia, Ramco Global Payroll covers countries such as Hong Kong, Philippines, Thailand, Indonesia, Singapore, Malaysia, Vietnam, China, India among others in APAC; all of GCC and Egypt, Nigeria, Ghana, Sudan, Republic of S. Africa, in Middle East-Africa; Australia, New Zealand, United States and the United Kingdom.